Today, we are going to explore a house room by room and see how fabulous design professionals Emmme Studio have transformed every single one into an incredible, modern and attractive space. This home was in desperate need of a make-over. As you'll soon find out, it was very old-fashioned and outdated. There was no style or appeal left. Yet these designers breathed new life into every single corner of this fabulous renovated home, showing just how much hope exists if you have the right expert on your side. What you will also notice, however, is how simple the new home looks. The spaces were redesigned to be more social and interactive, at the family's request. The family loves to cook together, so the home needed to work for them both functionally and aesthetically. You'll love this creative and functional solution! The living room of this home was very dark and dingy before the renovation. Despite the doors and windows, the room received very little natural light. The dark wooden furniture entrenched the dark look and feel. There is also too much furniture in this space, which clutters and crowds the small home. The decor is also very old-fashioned and outdated. It looks like our granny's home! The after image doesn't even look like the same house! The designers have opened up the windows and doors, removing the shutters. This instantly allows natural light to flood the interior space. 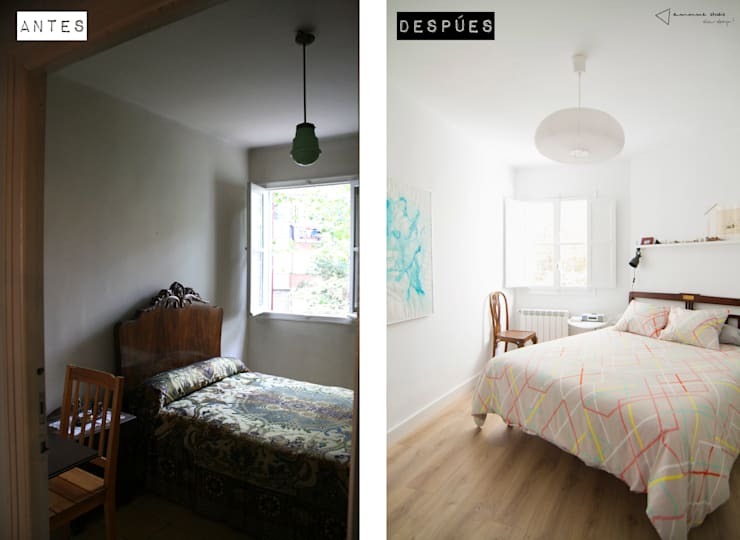 They've also opted for white walls and light wooden walls, which enhances the sunlight that flows into the home. They've also opted for modern and simple light furniture and a few carefully selected pieces of art, that bring a touch of charm and personality to the room. The kitchen has completely changed thanks to the designers! Before the renovation, it was closed off from the rest of the house, making it very small and cramped. There is no space for the family to cook together in this little area. We can also see that the red patterned floors do nothing for this outdated space. The designers have knocked down the wall, allowing the kitchen and the dining room to flow into one another. This makes for a much more interactive and spacious area. The old-fashioned finishes have also been replaced with modern counter parts, including simple yet elegant white cupboards and shelves and homely wooden counter tops. 3. Bathroom blues to bathroom beauty! 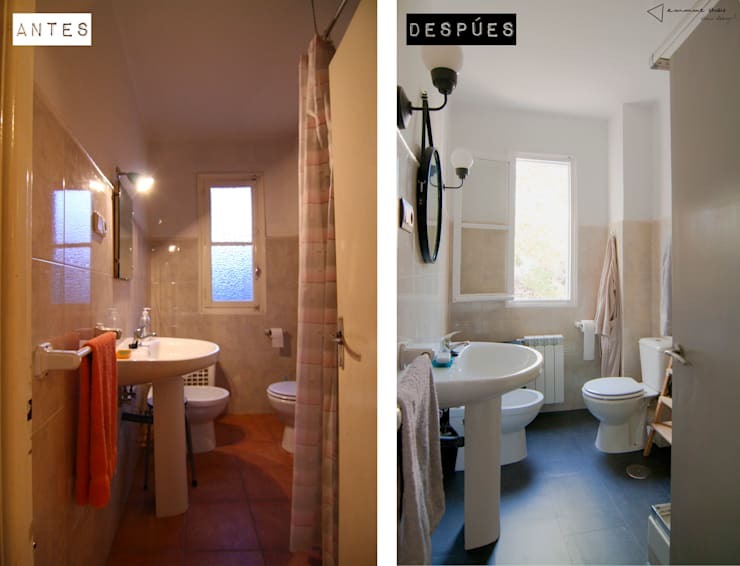 The bathroom is a wonderful example of how just a few small changes can change the whole look and feel of a space. If you look carefully, not too much has been altered in this room. Yet it looks so different! The designers have replaced the old-fashioned mirror with a round, trendy version. The boring and bright lights have been replaced with some trendy lanterns, which make the bathroom seem that much more elegant and sophisticated. The window has also been opened, allowing fresh air and sunshine to flow into the room – a much better option for this space. The master bedroom used to look like something out of a ghost story! With its old quilted duvet, intricate headboard and dark tones, it seems like a cave from medieval times. The designers have shed some light on the room – literally. 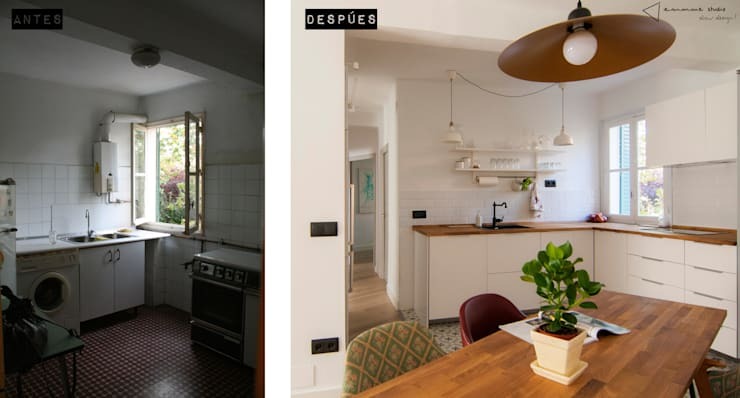 The light floors and white walls reflect the sunshine that flows through the window and the furniture has been replaced with lighter and more modern options. The pastel-coloured duvet is far more appealing for this space. A carefully selected artwork hangs on the wall, bringing a bit of subtle colour and personality to the room without overwhelming it. 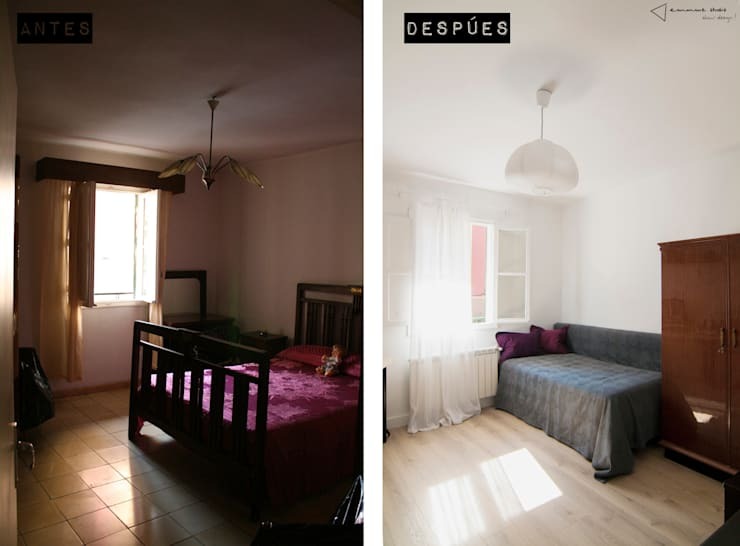 Do you see how natural light can change the whole ambiance of a room? This spare bedroom was another example of a very dark and dingy design. The deep purple linen did nothing to enhance the space! The old tiles on the floor are also very old-fashioned and unappealing. Imagine how cold this room would be in winter? The new bedroom has been redesigned so that it is a more multi-functional space. A fold-out sofa allows this room to be used as a living area or bedroom, while the soft and slightly transparent curtains ensure that there is always sunshine flowing through the windows! 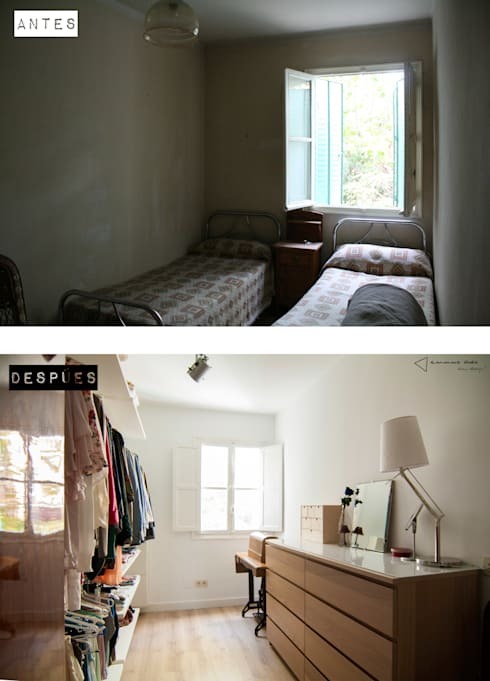 The third bedroom featured twin beds but was so gloomy looking that no one would want to stay in it! The designers decided that there was no need for this bedroom so they have transformed it into a far more functional space – a walk-in closet! This gives the family more than enough space to choose their outfits for the day, apply make-up, brush hair and choose accessories. Don't you agree that this is a far better use for this space? 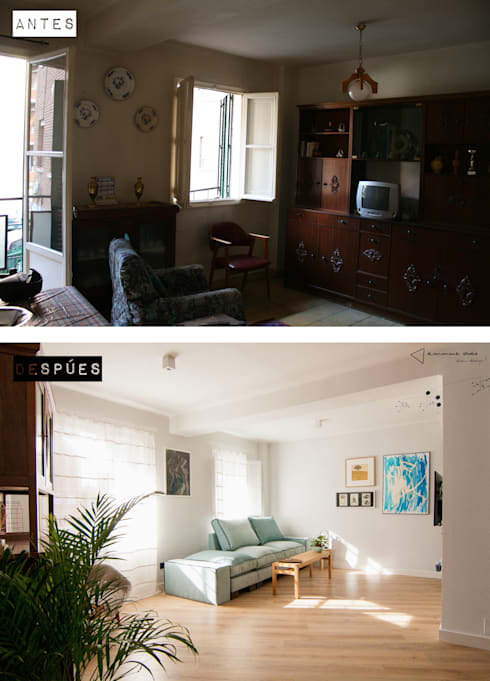 If you have enjoyed this before and after, you'll love this one too: Before and after: From stale to stylish!